I entered an office yesterday and on the empty receptionist desk, found the following sign. I took them at their word and wandered back into the office. An employee immediately saw me and came up to me to help me find the person I was going to meet. We went to lunch and upon returning to their office, my host stepped into the back for a few minutes, letting me spend time in the reception area perusing their wall to wall bookshelves (which themselves told me quite a bit about their company in and of itself…more on that another day). As if to prove that this was not a fluke, but rather that Customer Service is a key part of their culture, no less than three employees passed through the reception area and each one stopped to ask me if I had been helped. 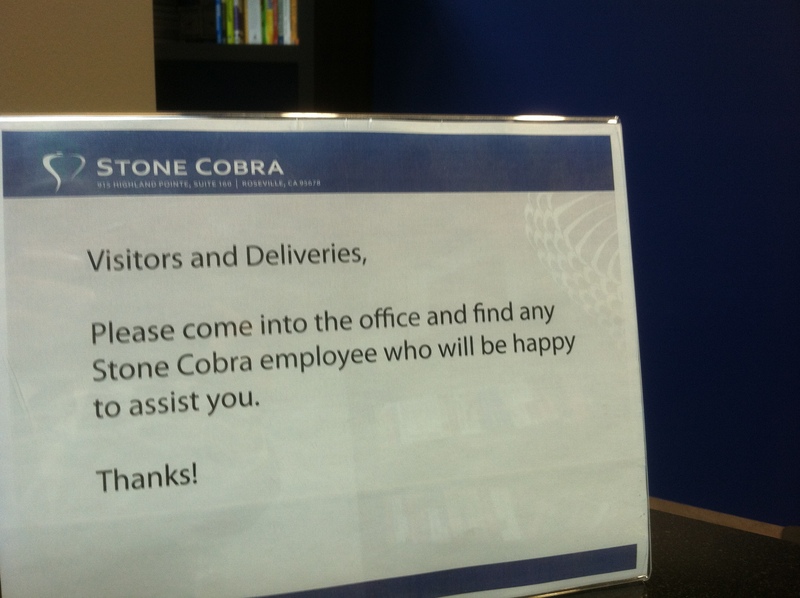 What a concept, no receptionist needed! There was none of the typical ‘avert your eyes on the way to the restroom’ mentality that is so often found in companies. There were no uncomfortable nods as employees tried to pass me without talking. It was very clear that they treat everyone as a Customer. Now…what kind of environment are we fostering in our Reception Area?